Before metal additive manufacturing became a viable technology, the only option for some manufacturers in the product development cycle was to have parts CNC machined while they waited for expensive tooling to be created for mass production. Metal additive manufacturing began to mature as a technology and has now taken center stage in the role of prototyping due to its ability to create parts relatively quickly and allow designers to make fast changes on the fly. Metal additive manufacturing is well suited for prototyping, but the high cost of the machines -- often in excess of $1 million for high-end laser sintering models-- makes it too expensive to move beyond the prototyping realm except for in very high-end applications that can justify the cost, such as in critical aerospace components. The vision of metal 3D printing companies has been to reduce the cost-per-part far enough so that additive manufactured parts can move towards larger volumes and in the direction of the industry holy grail, which is high volumes of end-use production parts. While new technologies are steadily moving in the direction of this ultimate goal, additive manufacturing today is beginning to occupy more of the space between prototyping and the volumes that can justify tooling up a full production line. CNC machining becomes more expensive as part complexity increases, and now we are seeing instances where metal 3D printing -- with its ability to make complex geometries -- is actually faster and more cost effective than having a part CNC machined. This includes volumes well above what would be considered prototyping. As promising as these new metal additive manufacturing technologies are looking, they will not completely replace CNC machining anytime soon. Instead, 3D printing will firmly settle into its sizable niche within the wide range of metal manufacturing technologies. 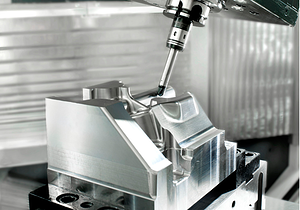 CNC machining will continue to have its place for a variety of applications where extremely tight tolerances are required. Also, additive manufactured parts often need post-processing, and a small amount of CNC machining is typically required to bring near-netshape parts into tight tolerances for applications that require them. Metal additive manufacturing and CNC machining will co-exist for years to come and will be complementary technologies for many manufacturers in the 4.0 factory of the future.